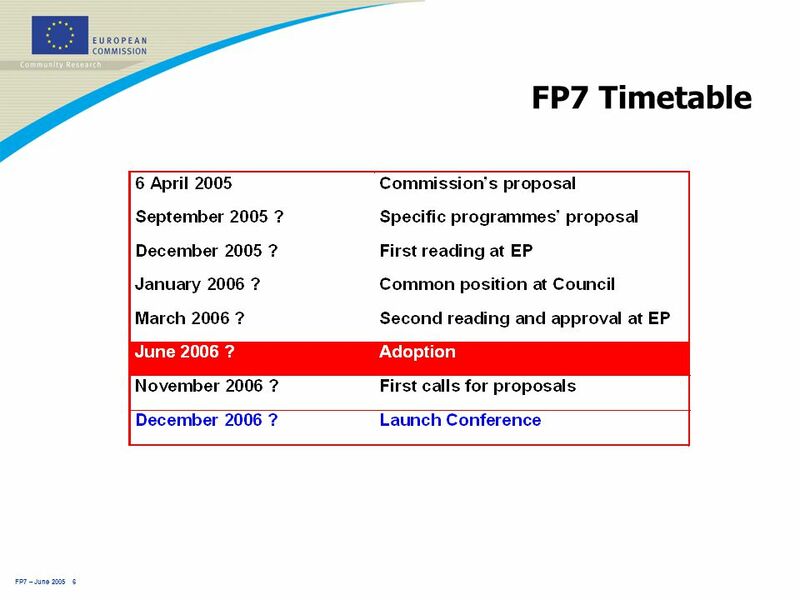 FP7 – June 2005 1 Seventh Framework Programme (FP7) l Commission’s proposal: 6 April 2005 →Now debated by Member States (Council ) and European Parliament. 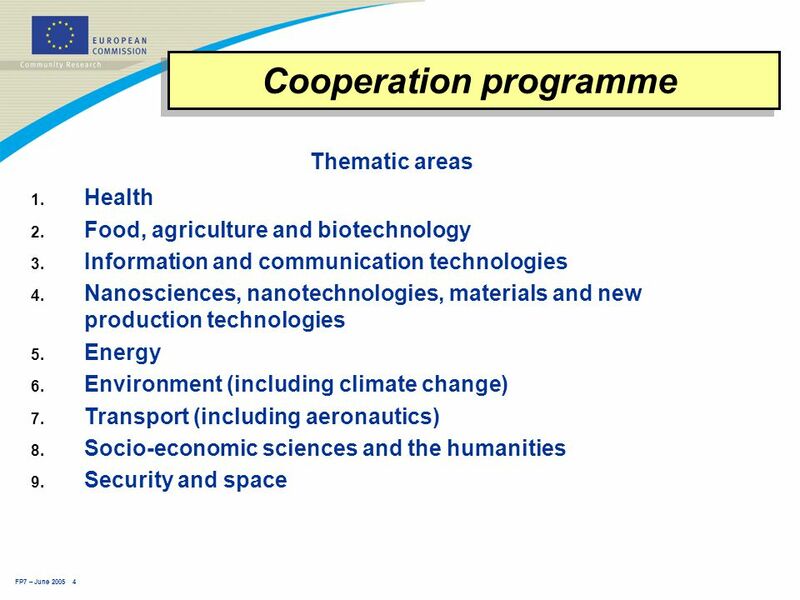 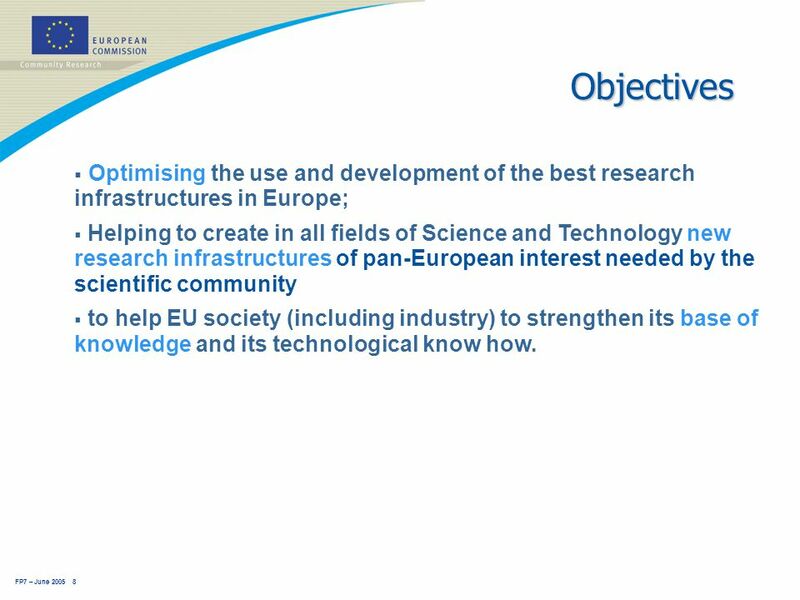 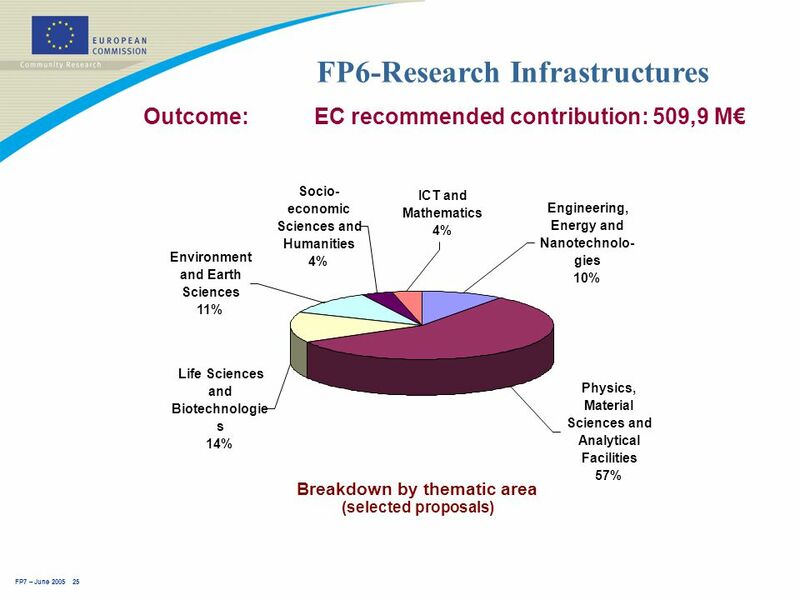 8 FP7 – June 2005 8 Objectives  Optimising the use and development of the best research infrastructures in Europe;  Helping to create in all fields of Science and Technology new research infrastructures of pan-European interest needed by the scientific community  to help EU society (including industry) to strengthen its base of knowledge and its technological know how. 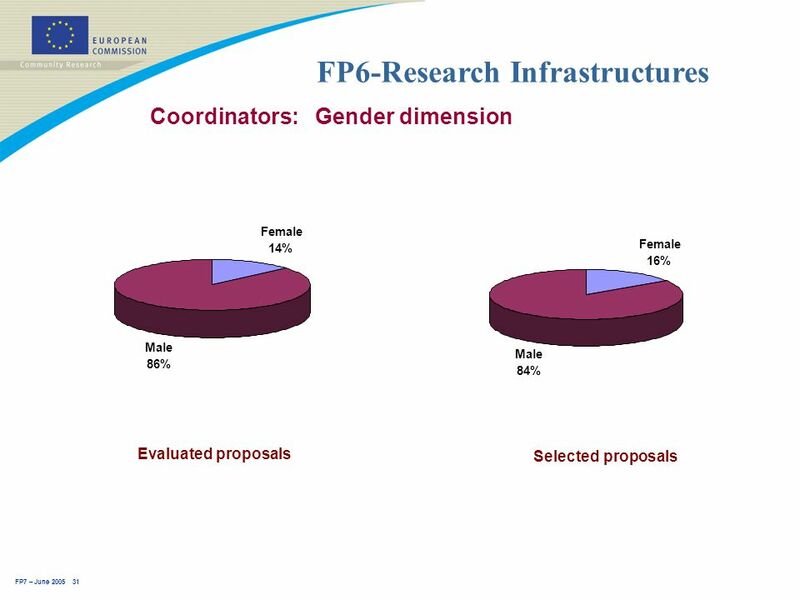 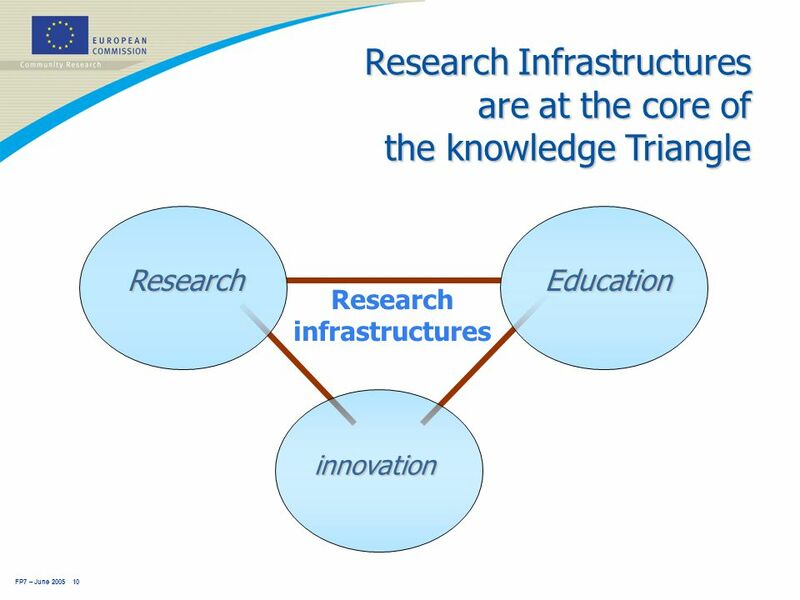 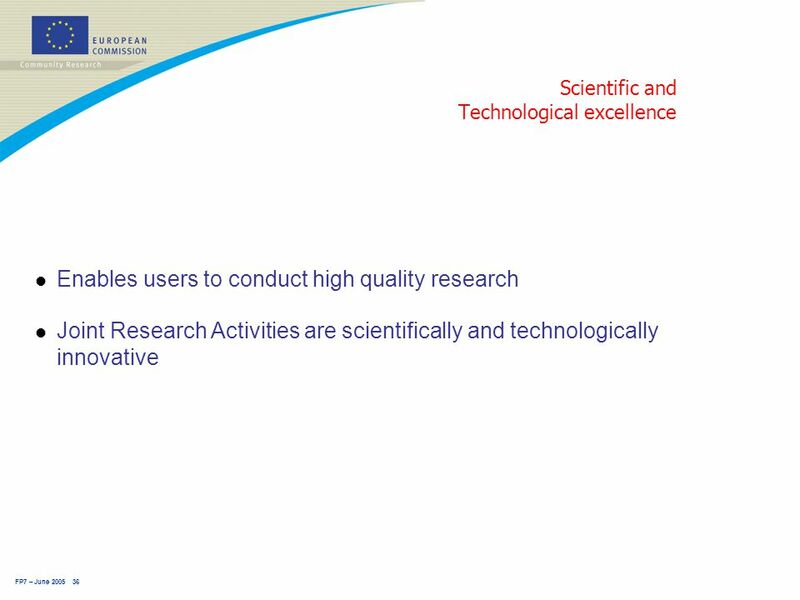 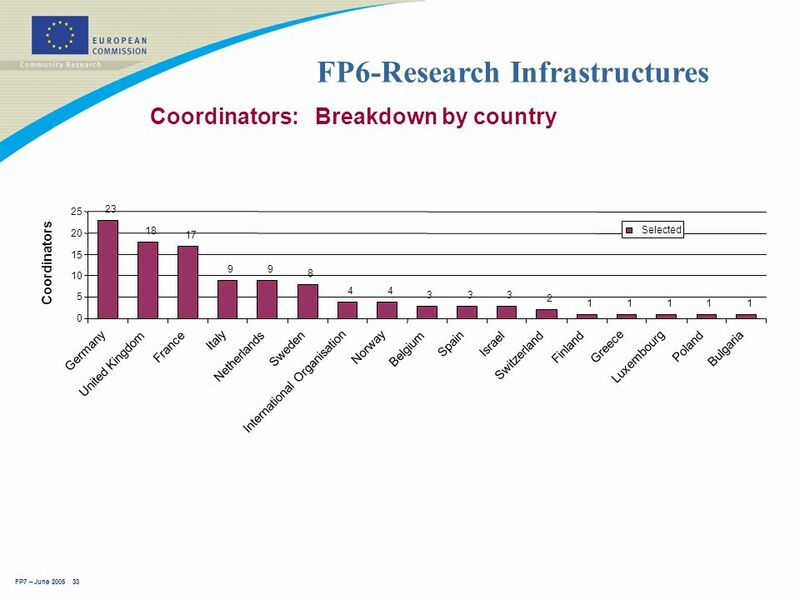 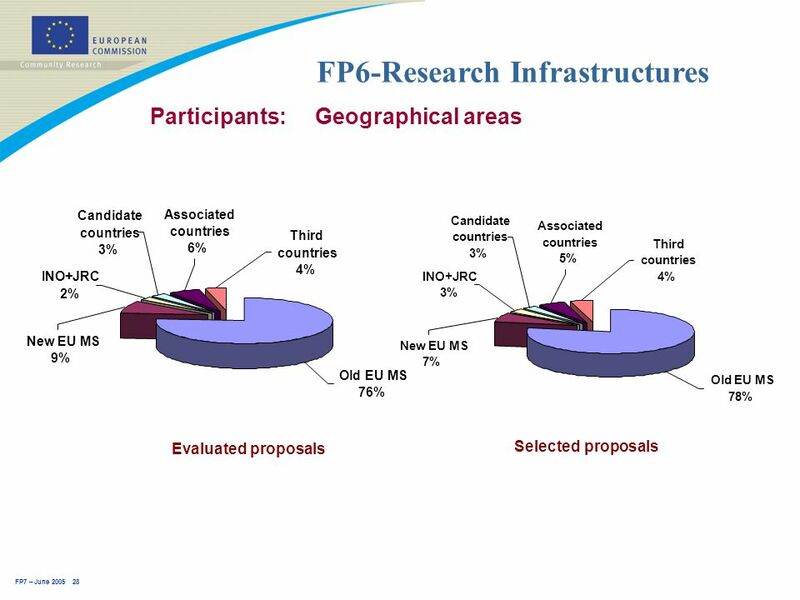 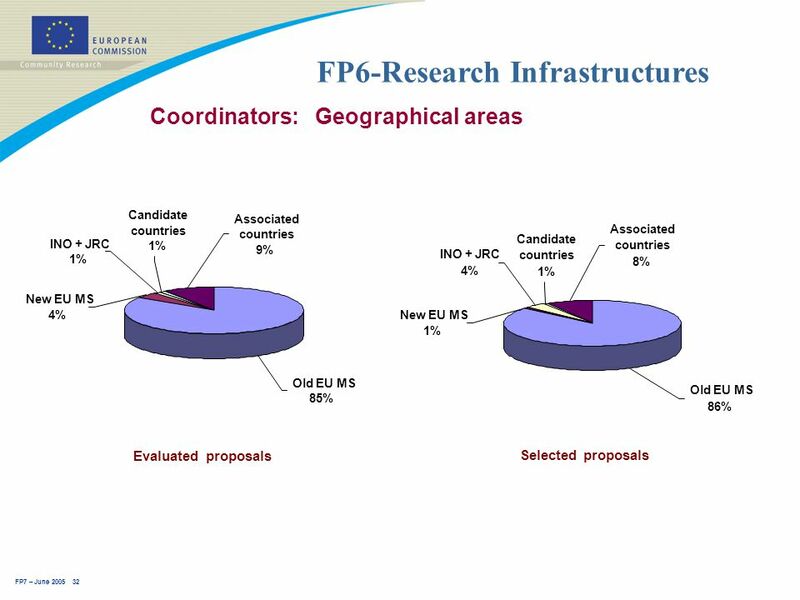 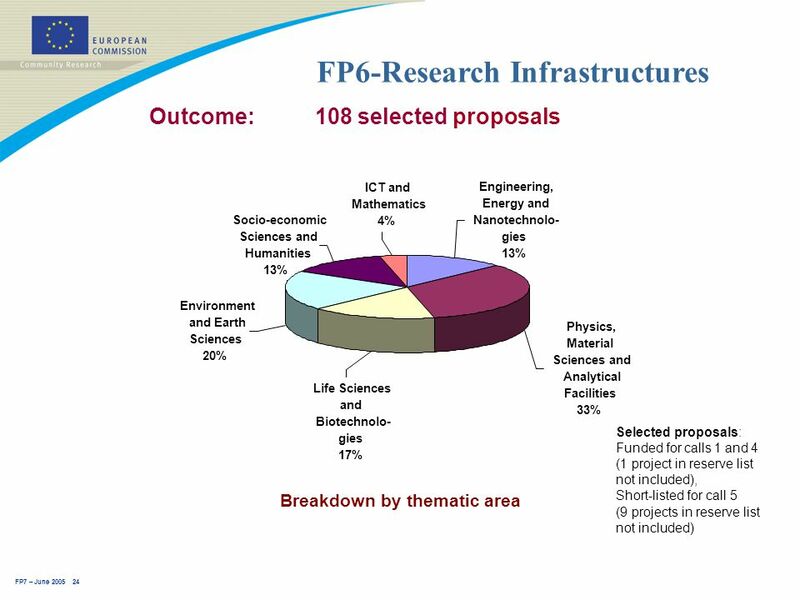 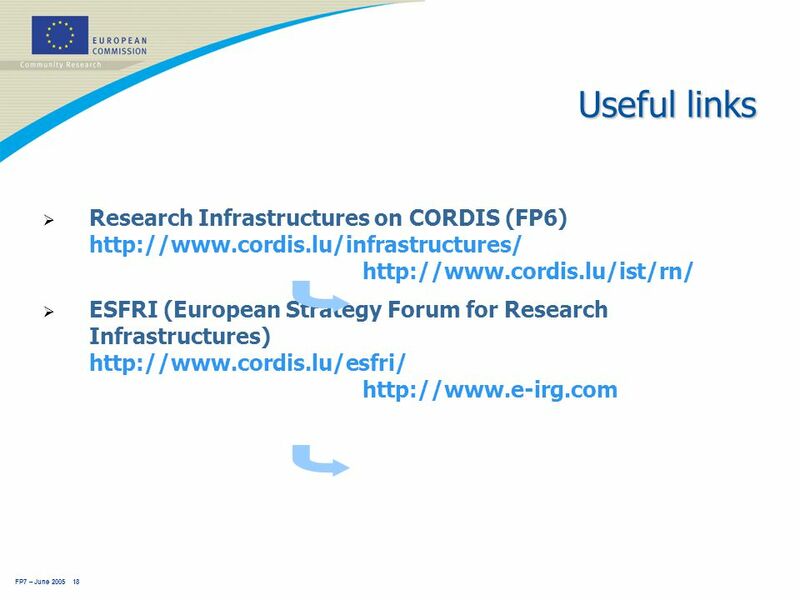 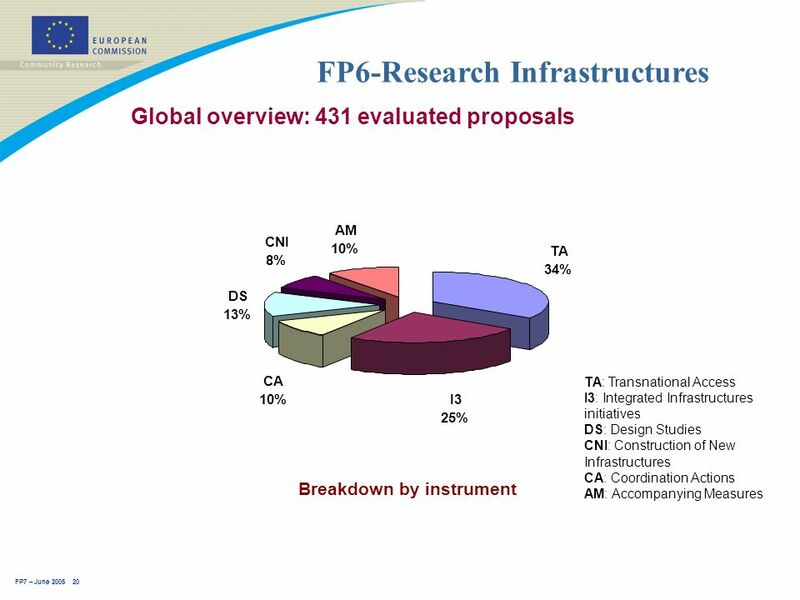 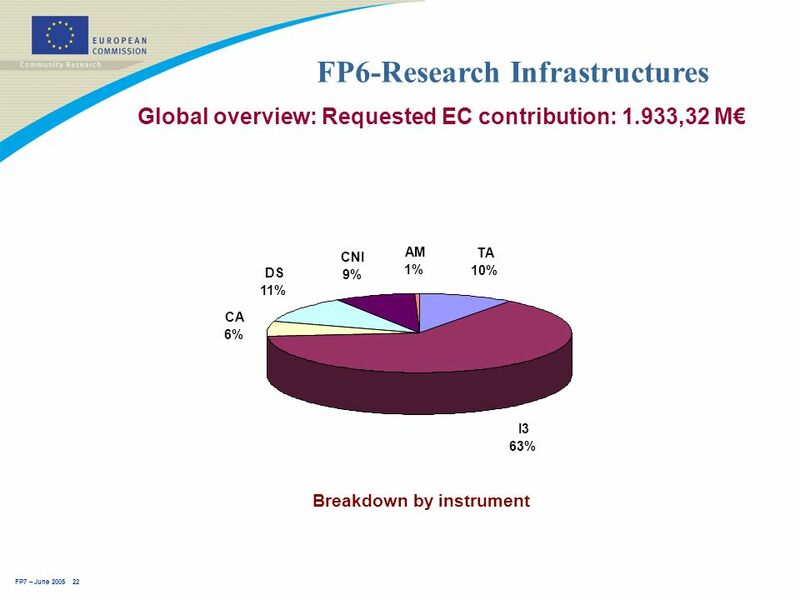 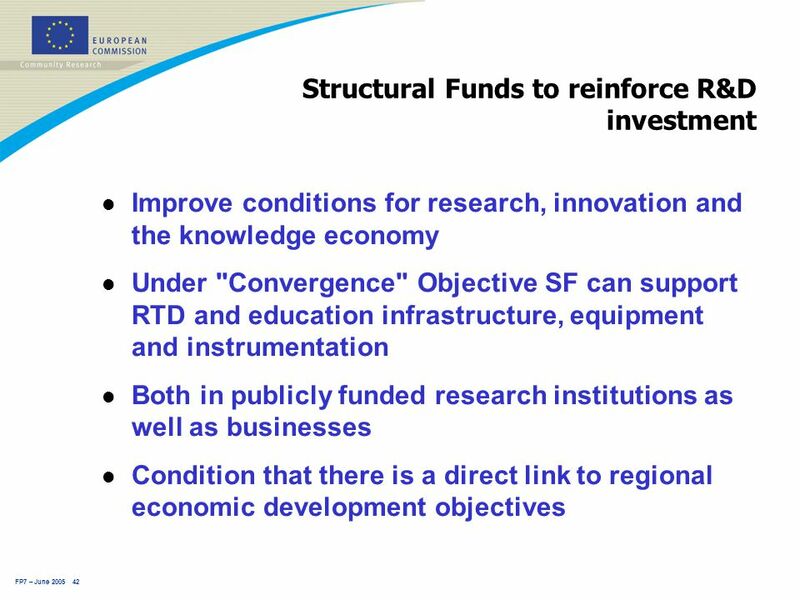 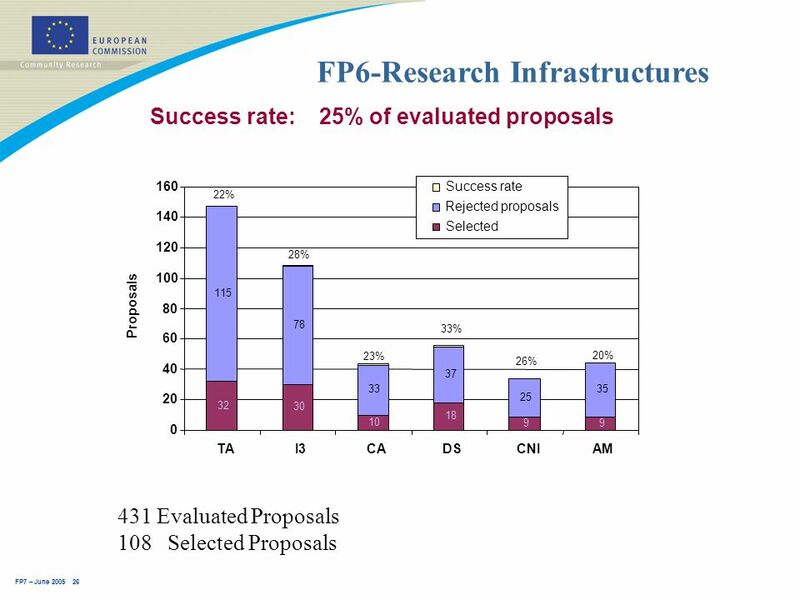 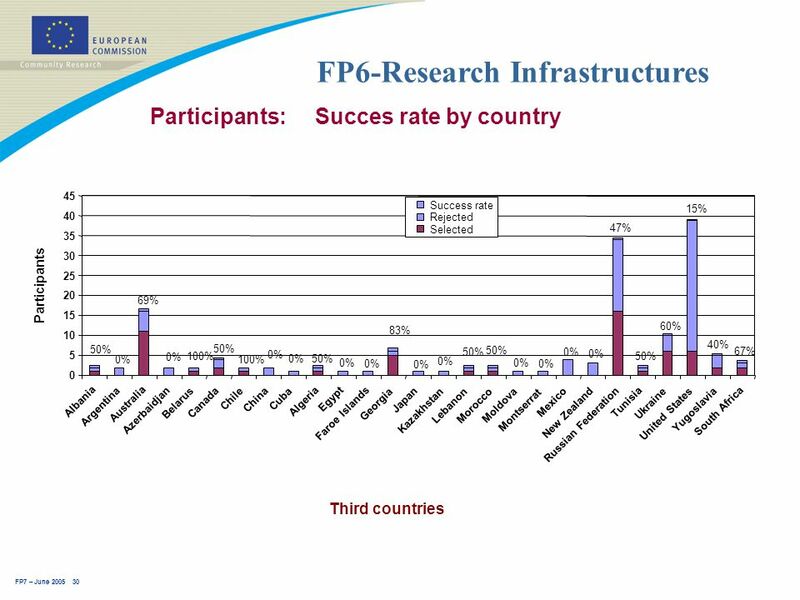 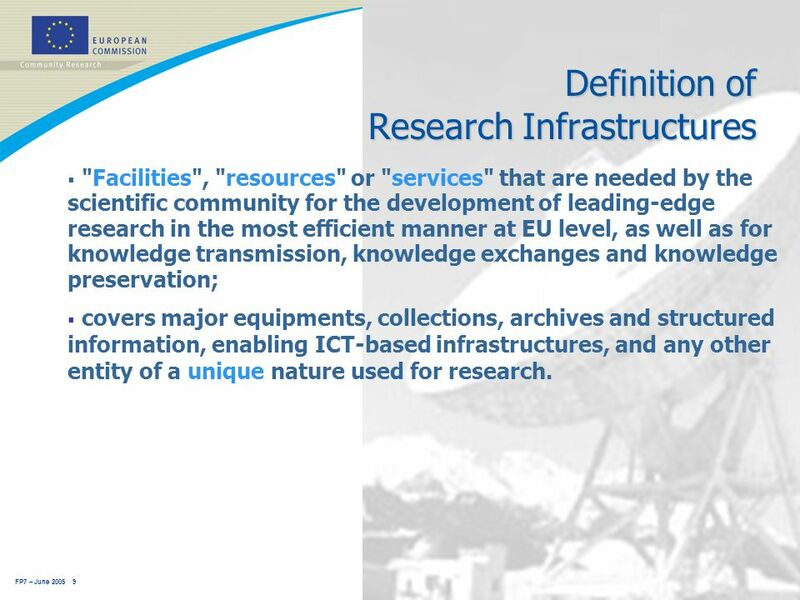 9 FP7 – June 2005 9 Definition of Research Infrastructures  "Facilities", "resources" or "services" that are needed by the scientific community for the development of leading-edge research in the most efficient manner at EU level, as well as for knowledge transmission, knowledge exchanges and knowledge preservation;  covers major equipments, collections, archives and structured information, enabling ICT-based infrastructures, and any other entity of a unique nature used for research. 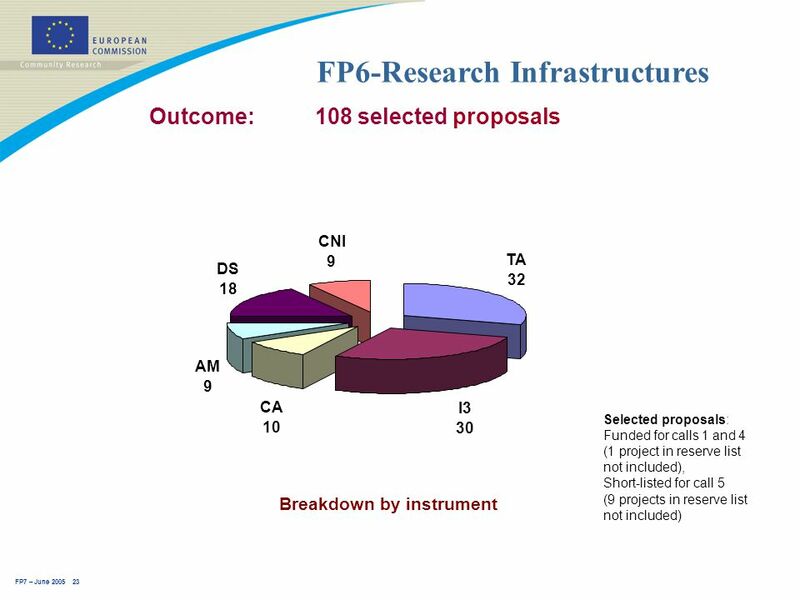 11 FP7 – June 2005 11 Activities forecasted under FP7 Support for:  Existing research infrastructures: aiming at optimising the utilisation, sharing / integrating resources and improving their performance;  New research infrastructures (incl. 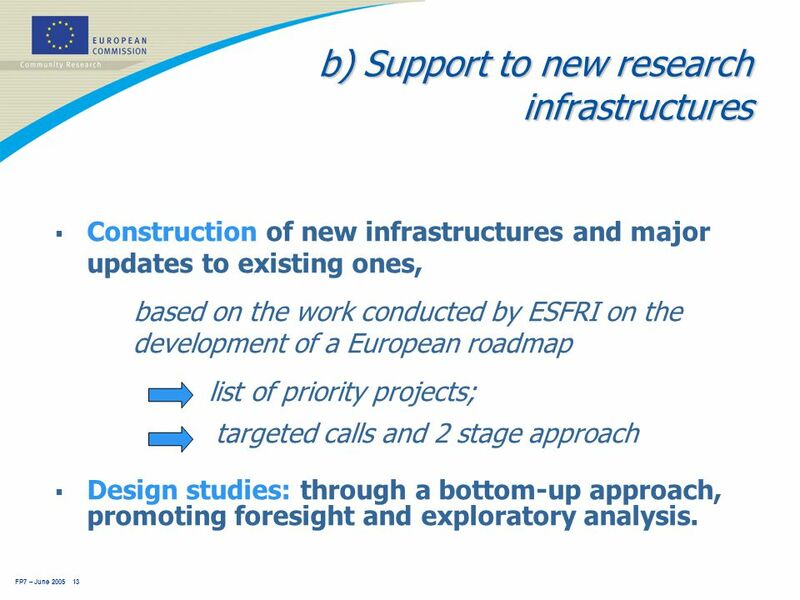 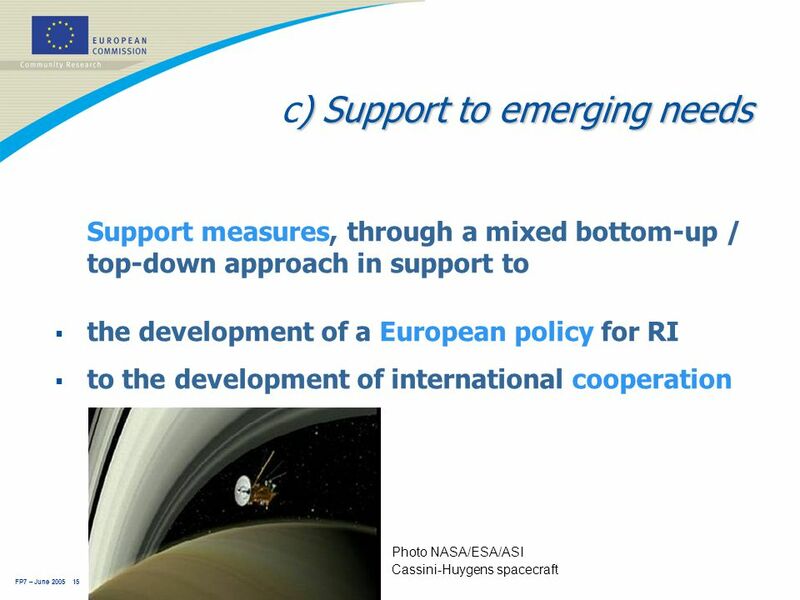 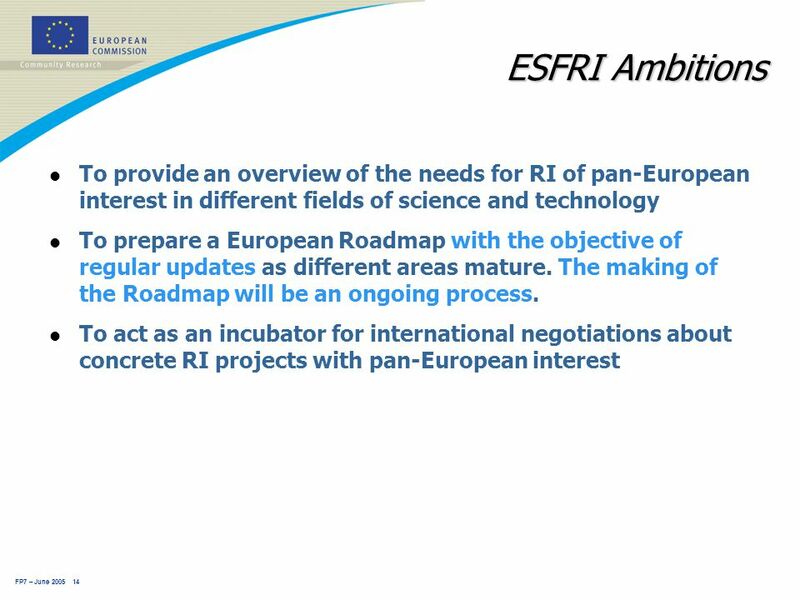 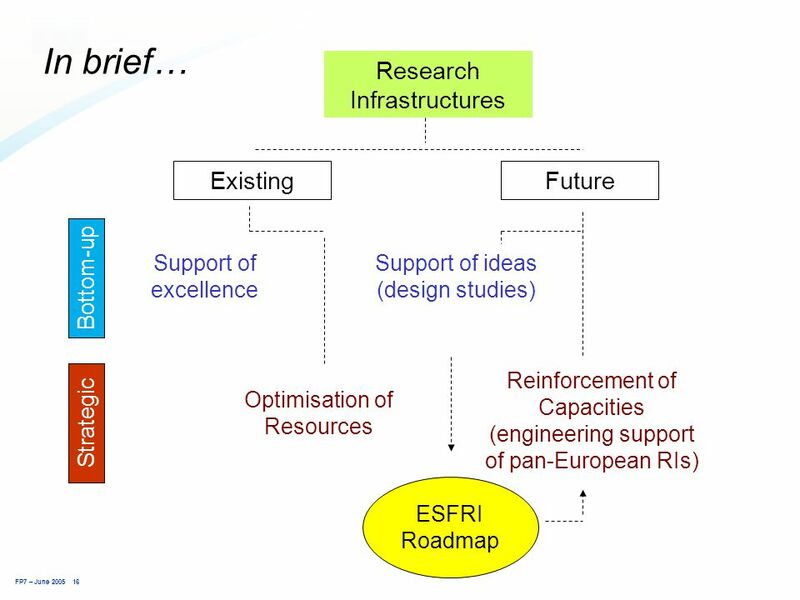 major upgrades) of pan- European interest based on the work of ESFRI;  Emerging needs: support to the development of a European policy on RI and of its international dimension. 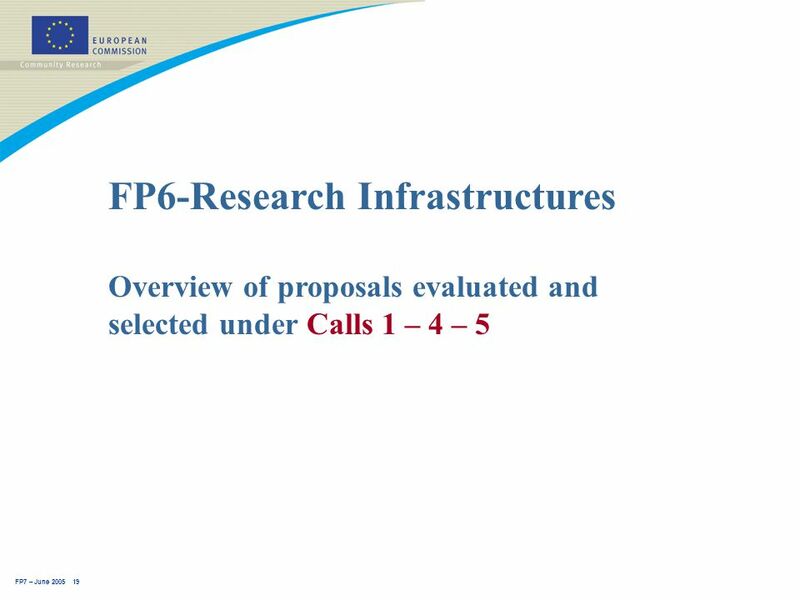 13 FP7 – June 2005 13 b) Support to new research infrastructures  Construction of new infrastructures and major updates to existing ones, based on the work conducted by ESFRI on the development of a European roadmap list of priority projects; targeted calls and 2 stage approach  Design studies: through a bottom-up approach, promoting foresight and exploratory analysis. 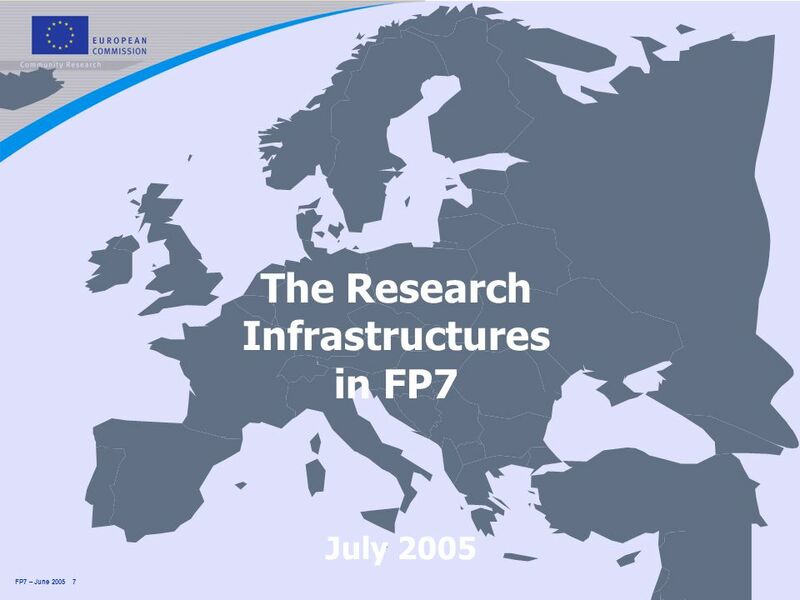 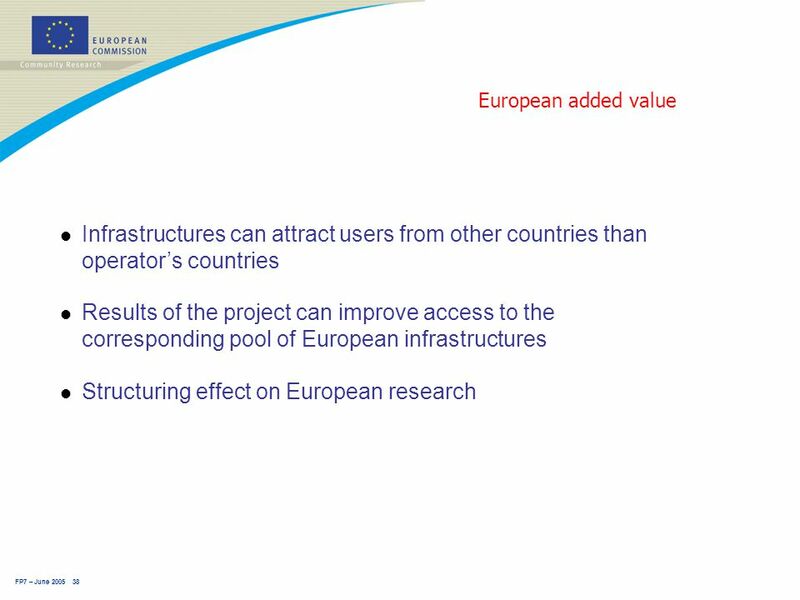 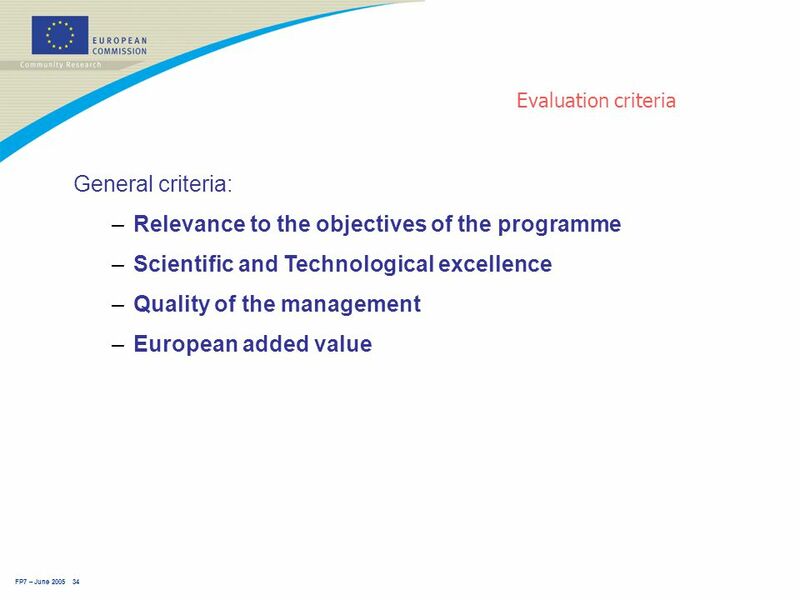 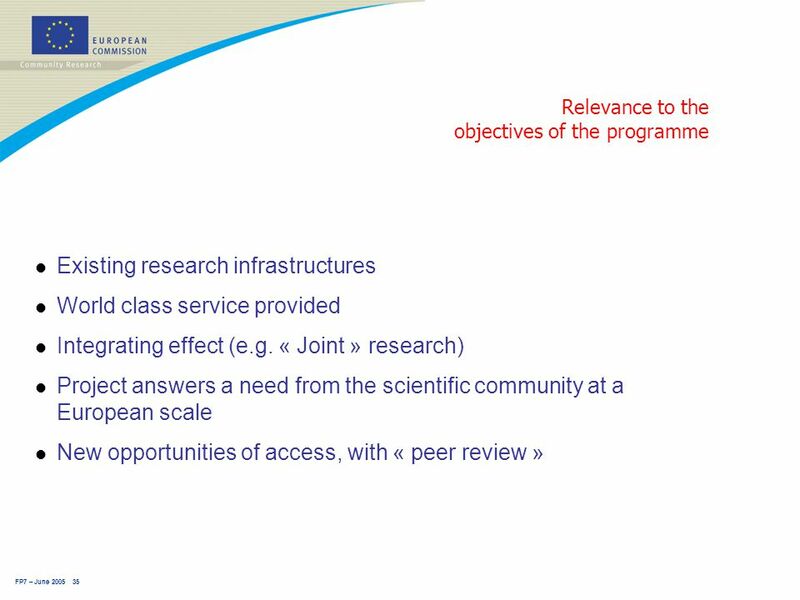 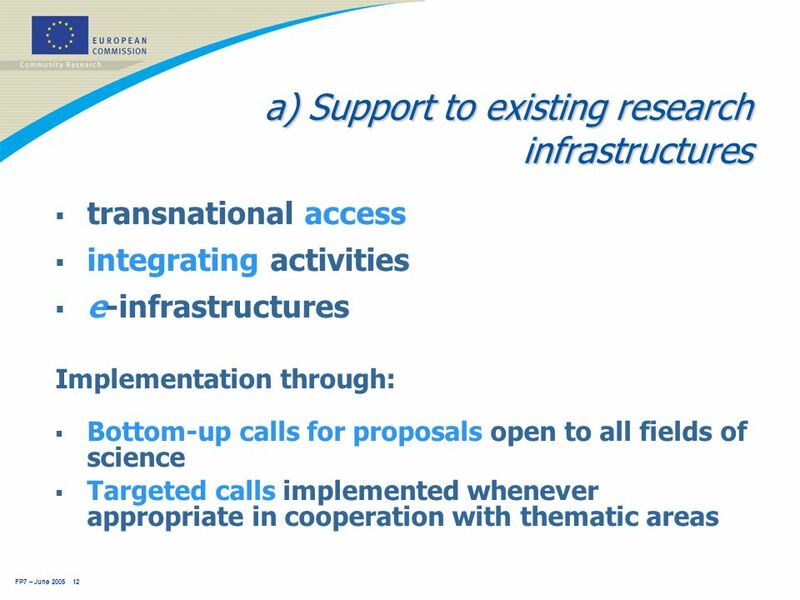 17 FP7 – June 2005 17 Clear Criteria for new Research Infrastructures  Capacity to offer a top-level service to scientific users and guarantee of scientific excellence through continuous performance upgrades;  Impacts at EU and international level, not only on scientific developments but also on long term socio-economic issues; support to ERA;  Maturity i.e. 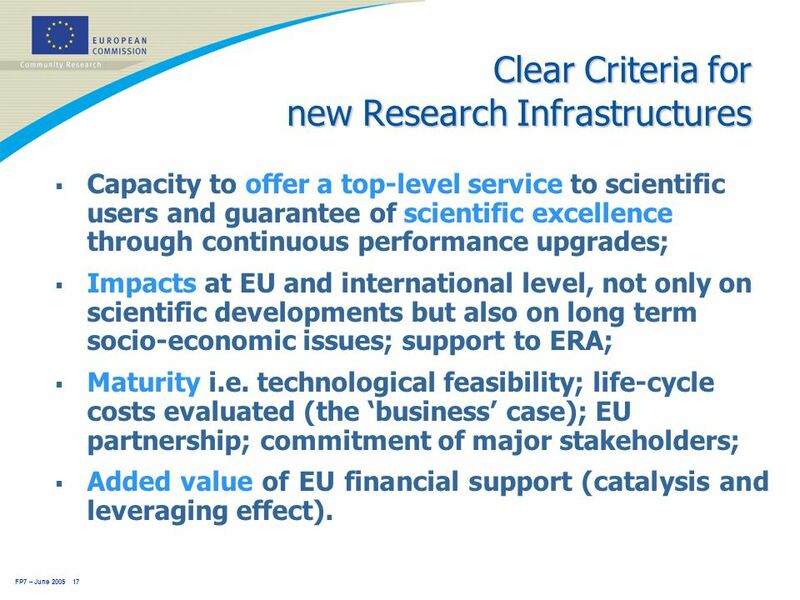 technological feasibility; life-cycle costs evaluated (the ‘business’ case); EU partnership; commitment of major stakeholders;  Added value of EU financial support (catalysis and leveraging effect). 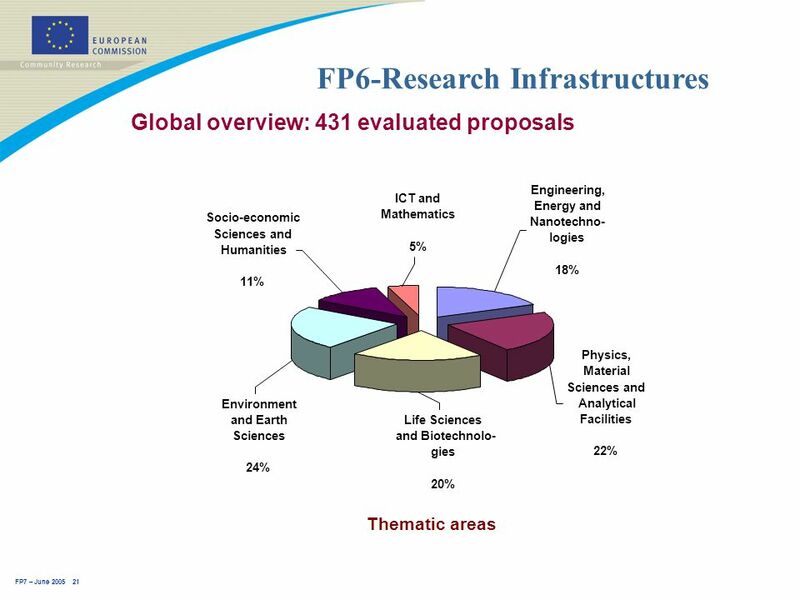 43 FP7 – June 2005 43 Typology of eligible actions l Infrastructures : business parks, innovation centres, incubators, research centres, etc. 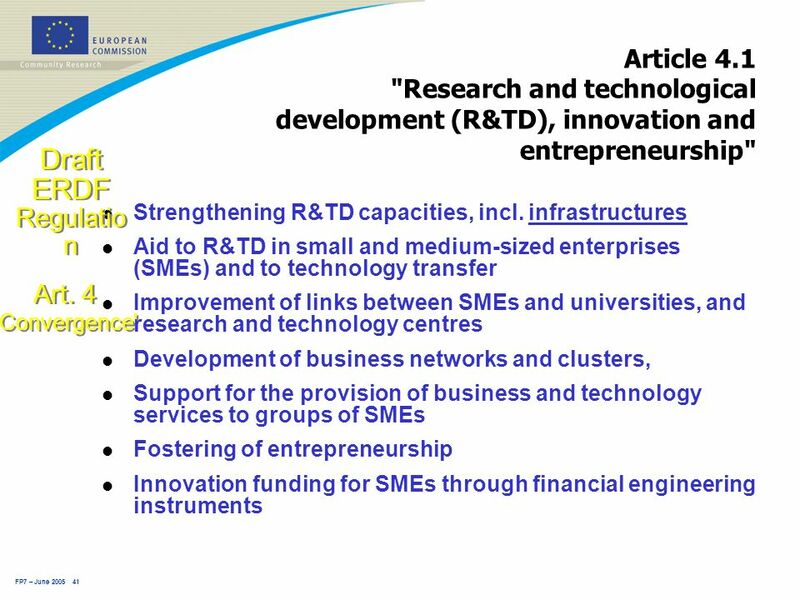 l Networks : development of clusters, competence networks, co-operation between university and SMEs, technology transfers l Innovative projects : transfer of new technology to business, start-ups, spin-offs (researchers into entrepreneurs), or straightforward research projects l Environment for Innovation : encourage innovation in SMEs e.g. 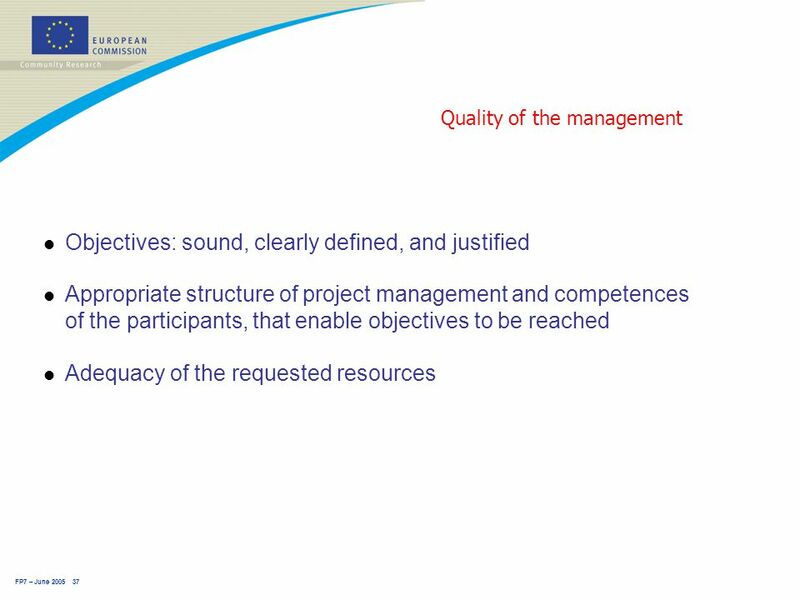 marketing, financing, consulting, etc. 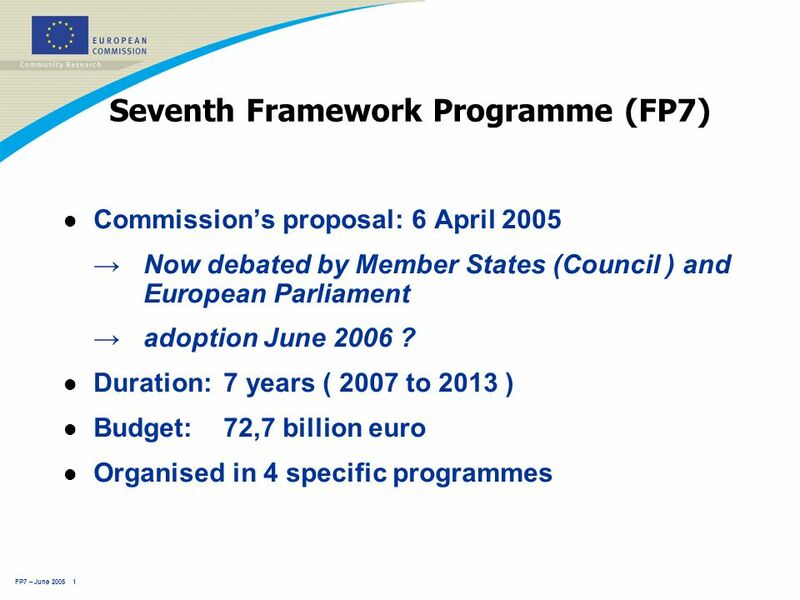 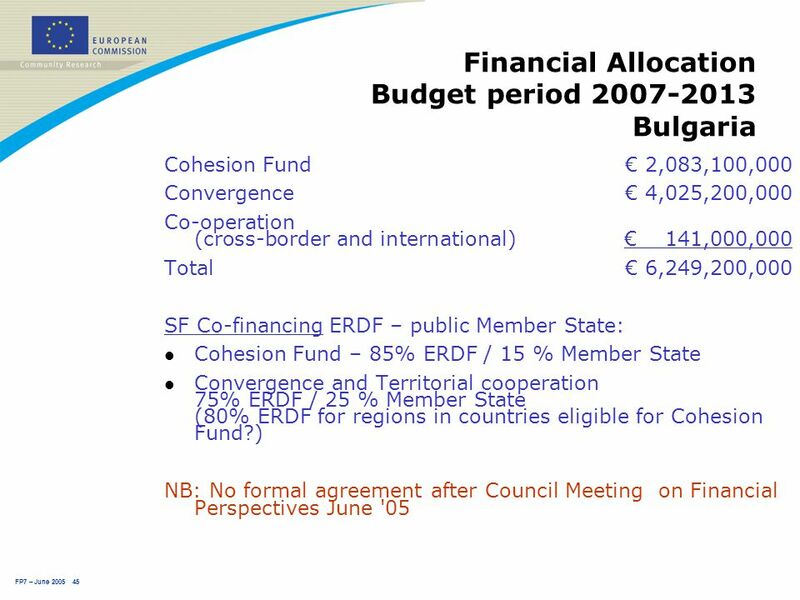 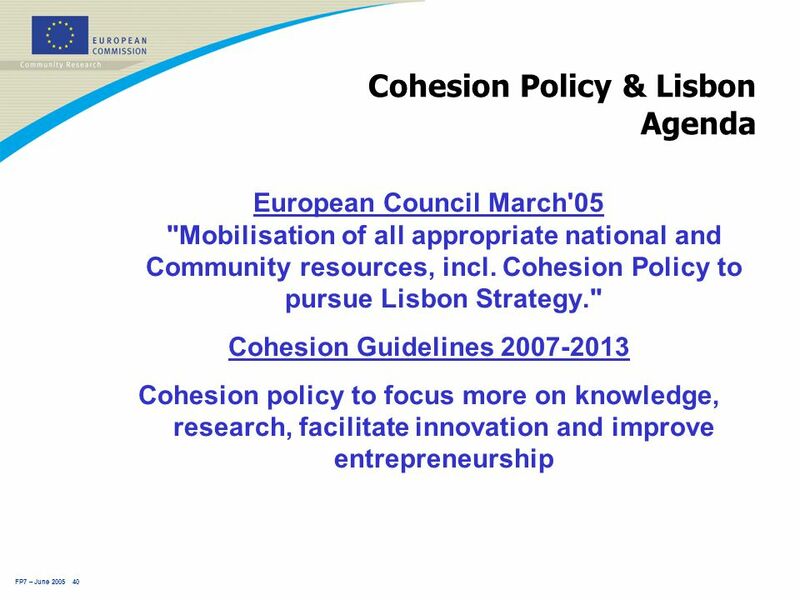 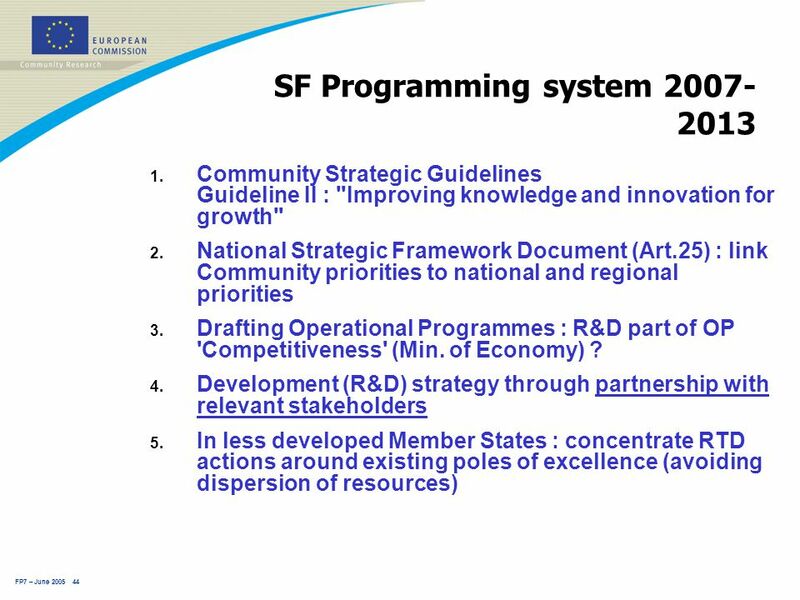 Download ppt "FP7 – June 2005 1 Seventh Framework Programme (FP7) l Commission’s proposal: 6 April 2005 →Now debated by Member States (Council ) and European Parliament." 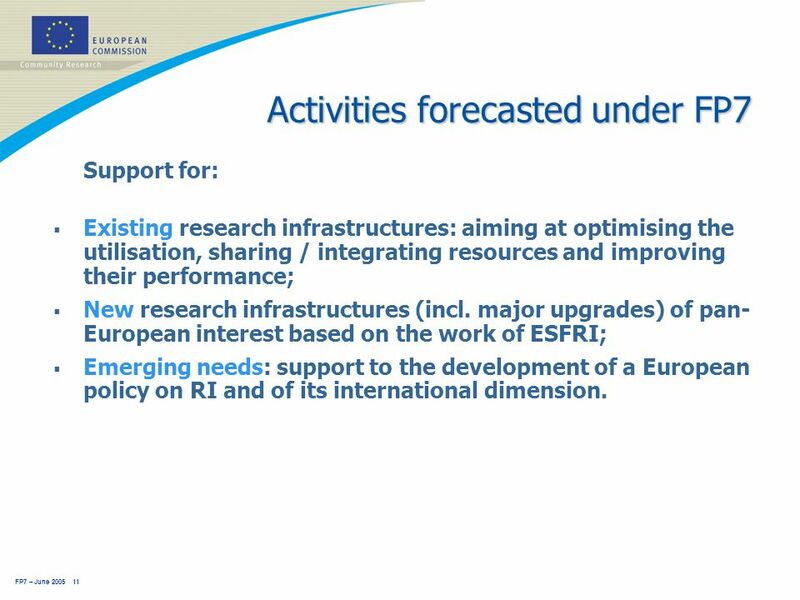 Overview of European funding opportunities for CES Wednesday, 2 nd November 2011 Huw Merfyn Hughes European Research Funding Officer. 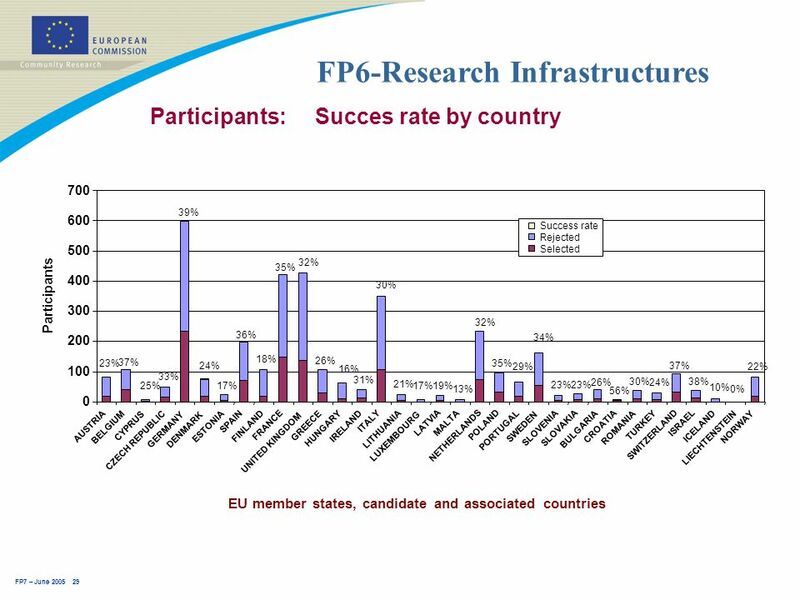 The Eurostars Programme is powered by EUREKA and the European Community Brno, 11 March 2009 EUROSTARS The EUREKA funding programme for R&D-performing SMEs. 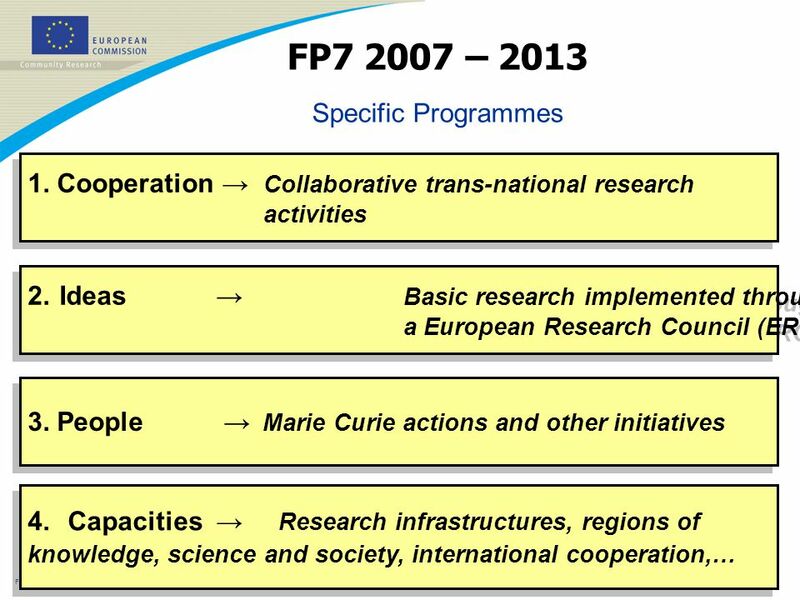 FP7 /1 EUROPEAN COMMISSION - DG Research Building a Europe of Knowledge Towards the SeventhFrameworkProgramme2007-2013.